Making short music videos you can share with millions of people might help you jump start your career in the music industry. At the moment TikTok Musical.ly is one of the best video sharing platforms for aspiring music video producers because it has more than 500 million active monthly users. While joining the TikTok's community and creating your own account is a simple process, deleting an account is a bit more complicated. The lack of privacy settings is often the reason why the app's users are choosing to delete their accounts permanently. If you'd like to deactivate your TikTok account, but you don't know how you've come to the right place, because in this article we're going to take you through all the steps of canceling a TikTok account. Only a short while ago users of the TikTok platform had to contact the customer support in order to delete their accounts. However, the recent introduction of the 'Thinking about removing your account' option has made this task much quicker. Here's how you can delete a TikTok account permanently in just a few easy steps. You must first add a phone number to a TikTok Musical.ly account before you can proceed to delete it. After you've launched the app, click on the Profile Information icon in the lower right corner of the app's window. Tap on the Settings option and then select the Privacy and Settings feature from the menu that pops up on the screen. Choose the Manage my Account option from the Settings menu, then locate the Phone Number feature and tap on it to insert your phone number. 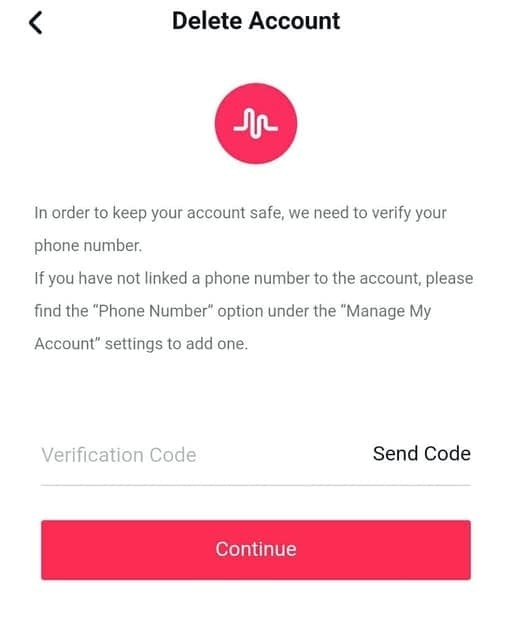 The app will send a one-time password (OTP) to your phone, so you just have to enter the verification code into the appropriate box, and your phone will be connected to your TikTok account. Afterwards, you should once again tap on the Profile Information icon in the lower right corner. Once the new window opens, hit the Settings icon. A pop-up menu will appear on the screen, proceed to select the Privacy and Settings option. The Privacy and Settings dialogue box will appear on the screen and you should tap on the Manage My Account option, that is located at the top of the list. Locate the Thinking about removing your account feature, then tap on it and the app will send an OTP message to your phone automatically. Insert the verification code you received in the OTP message into the appropriate box and hit the Continue button to complete the process of deleting your TikTok account. Keep in mind that your account cannot be recovered once it is deleted and that all information that wasn't saved on it such as chat messages is going to remain visible to other users of the TikTok platform after you deactivate your account. If you don't want to lose all the videos you shared on TikTok you should download them from your profile to your phone because all the data that was stored on your account is going to be deleted. What's more, you will not receive a refund for any in-app purchases you made while you were using TikTok. If you would only like to go on a social media hiatus for a while, the app offers some advanced options that will enable you to keep your account while remaining completely invisible on the platform. Here are some of the solutions you might want to consider before deciding to delete your TikTok account forever. The platform offers several advanced options to its users that enable them to be hidden from the public eye. That's why you don't have to deactivate your TikTok account if you don't want your music videos to be accessible to other users of the platform. Here are a few alternative options you have at your disposal. The TikTok app can be used in Private mode, even though all accounts on the platform are Public when you first create them. All new followers will have to send you a friend request in order to view your videos once you switch to private mode, which enables you to control who can see the content you share on your account. This option can be activated by heading over to the Settings menu and choosing the Privacy and Safety feature. Afterwards, you just have to toggle the Private Account option on, and after a short while, only your followers will be able to see the content you post on TikTok. The 'Allow others to find me' option lets you control who can see your profile because if you enable it, your account won't appear in the friend suggestions other users receive from the platform. You can find this option in the Privacy and Safety menu, so you can just switch it off if it's enabled by default. You can switch it back on whenever you want if at any point you decide that you want to be featured in follower suggestions. Limiting the number of people who can get in touch with you through TikTok is another way to increase your safety on this video sharing platform. Who can send me messages, and Who can send me comments options are available in the Privacy and Safety menu, so you can easily set both of these options to Just Friends if you'd like to avoid receiving messages from TikTok users you don't know. The recent updates of the app and the introduction of the Thinking about removing your account option made deleting a TikTok Musical.ly account a quick process. However, this action is permanent and once you deactivate your account, you won't be able to use it again. That's why you need to think this decision through, especially because the app offers a number of ways to increase your privacy.